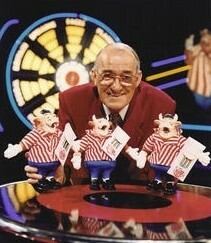 JIM BOWEN is a Lancashire born ex-Deputy Headmaster with a natural flair for comedy in his own unique style. While teaching he became involved with the local Dramatic Society which kindled his interest in show business. In the sixties he worked as a �stand-up� comedian on a part-time basis on the notorious Northern Club circuit. The advent of Granada TV�s �The Comedians� gave Jim the opportunity to appear on National Television which prompted him to leave teaching and �Have a Go� in the precarious world of entertainment. Television opportunities followed and Jim made appearances on Granada�s �Wheeltappers and Shunters� Social Club� alongside Thames Television�s late-night chat show �Take Two�. Central Television�s �Up For the Cup� and �Starburst� featured Jim together with �Summertime Special� and �Noel�s House Party�. (He was �Gotcha�d� by Noel as part of his Saturday night programme). Many other guest appearances followed including �Celebrity Squares�, �Pebble Mill�,� Family Fortunes�, �Des O�Connor Tonight� and numerous Christmas Television Specials. His autobiography �From a Bundle of Rags� was published in 1992 in hardback and went to paperback the following year. Ten years later he wrote an updated version of his life entitled �Right Place Right Time�. A cabaret artist and entertainer, he is also happy playing situation comedy or straight roles, including �Foxy Lady� with Diane Keen, �Happy Together� with Julie Walters and several cameo roles in �Last of the Summer Wine�. He played a major character as a crooked accountant in Central Television�s prestigious 1980�s six part film drama �Muck and Brass� starring Mel Smith. More recently Jim appeared in �Jonathan Creek� with Alan Davies, �The Grimleys� alongside Brian Conley and as �Hoss Cartwright� in the second hilarious series of �Phoenix Nights� starring Peter Kay. Sarah Lancashire cast Jim as �Norman� in �The Bingo Hall�, one of 6 afternoon dramas for BBC 2 in October 2004. He was very familiar to Northern audiences as �Alf�, the long-suffering barman in 14 very successful commercials for Tetley Bitter. In 1986 he was the subject of �This is your Life� with Eammon Andrews, and in 1988 Sarah Kennedy caught him by surprise as she revealed his schooldays in Central TV�s �Classmates�. Since his early years he has been an avid jazz fan and is probably the most frustrated trumpet player in the world! This has led to almost two decades cruising on QE2 with �The Hot Rhythm Orchestra� several times a year. At present he is appearing on the Fred Olsen cruise ships where he is performing his "Evening With Jim Bowen" act which contains some of his hilarious recollections of his life in show business. His after dinner speeches are regarded by his peers as amongst the funniest on the circuit, where he highlights the frailties and shortcomings of show business and all its trappings, featuring particularly the �Bullseye� era. He is of course best known for his �Bullseye� TV game show, which for fifteen years was avidly watched by over twelve million viewers, attaining �cult� status among University students. This has led to regular appearances at both the Oxford and Cambridge Unions. Instantly recognised throughout the UK, Jim is good value on the corporate scene where his varied stage and screen experience is invaluable. From 1999 to 2003 Jim worked for BBC Radio Lancashire, presenting and creating a hugely popular live morning magazine programme. The last year has seen a resurgence of interest in �Bullseye� as it is shown four times daily on �Challenge TV�. This has resulted in numerous guest appearances on all channels from BBC 2�s �Weakest Link� which he appeared 3 times (twice a winner!) to �Des & Mel�, �Richard & Judy� and the delightful morning show with Phil & Fern. In 2005,2007 & 2008 Jim appeared at The Edinburgh Festival enjoying success in all three seasons. It was a one hour long ramble featuring a little bit of �stand-up� interspersed with riotous tales about his time in the business culminating in �Bullseye� stories which beggar belief. A �Question & Answer� segment closed the show. He now takes this package around smaller theatres where he indulges his audience with two hours of banter and scandal of a highly amusing nature. A task he thoroughly enjoys. The Edinburgh experience was one Jim approached with relish and was received with great enthusiasm by the audience. For everyone that attended Jim would like to say thank you for being such an appreciative and warm audience.